Situated on the bustling corner of Beacon and Washington Streets in Brookline, The Fireplace, a sophisticated New England Grill, offers, in the words of Chef/Owner, Jim Solomon, "New England earthiness in a stylish setting." Jim has created a stunning menu rich with the bounty of New England shores and gardens. From the moment you enter the restaurant, your eye is drawn towards the flames of the working stone fireplace, the restaurant's namesake. Borrowing the natural colors and textures of the New England landscape, Jim designed a warm and cozy space in which to enjoy the bounty of the region. To complement the menu, Wine Steward & General Manager, Randy Clutter, composed an impressive all-American wine list. 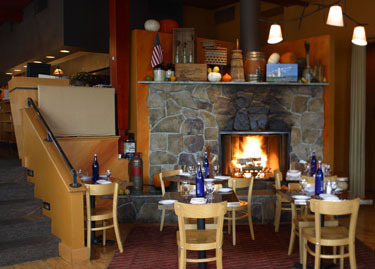 In addition, The Fireplace offers a broad selection of New England micro-brewed beers and sensational cocktails. Outstanding Wine List - Wine Spectator.